Ford intends to conduct deep restructurization of its entire business in Europe. The focus is on strengthening competitiveness and profitability of the company. The important part of the plan for the future is broad electrification, which will concern every new model, including the all-new Ford Focus. We appreciate that the entire portfolio will be electrified, but it's hard to say how many models will go all-electric and plug-in hybrid. "Every Ford nameplate from the all-new Ford Focus onwards will include an electrified option. This includes new nameplates and new versions of existing vehicles. From Fiesta to Transit, either a mild-hybrid, full-hybrid, plug-in hybrid or full battery electric option will be offered, delivering one of the most encompassing line-ups of electrified options for European customers." One of pillarz of the three-pronged strategy in Europe is import - Ford re-announced the all-new Mustang-inspired full-electric performance utility in 2020. Debut of this particular model is scheduled for April 2019. "Imported Vehicles: A niche portfolio of imported iconic nameplates for Europe that builds on the heritage of the Ford brand will include Mustang, Edge, and another SUV to be revealed in April, along with an all-new Mustang-inspired full-electric performance utility in 2020." Ford Motor Company CEO, Jim Hackett said (see video below) that new lineup of electric vehicles is coming, including F-150 and Mustang. Hopefully, we will see those on the market soon. COLOGNE, Germany, Jan. 10, 2019 – Ford is starting consultations with its union partners and other key stakeholders to implement a comprehensive transformation strategy aimed at strengthening the Ford brand and creating a sustainably profitable business in Europe. The strategy – which is part of the company’s broader global vision of providing smart vehicles for a smart world – will offer differentiated vehicles designed to create a deeper connection with Ford customers. Near term, Ford is accelerating key fitness actions and reducing structural costs. 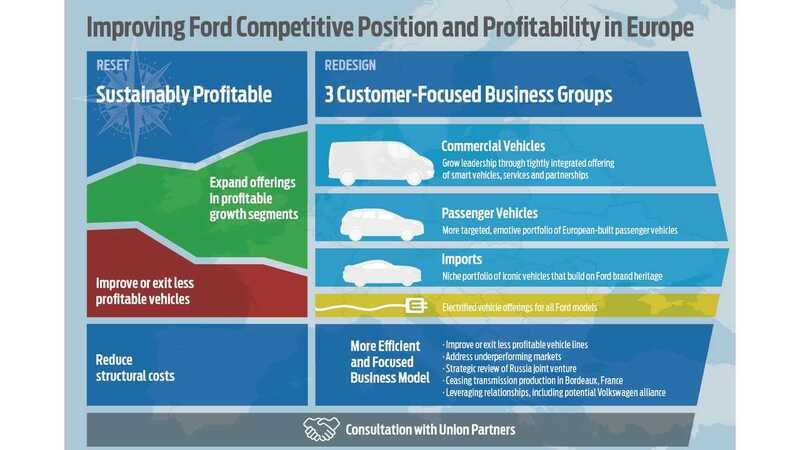 In parallel, the fundamental redesign will include changes to Ford’s vehicle portfolio, expanding offerings and volumes in its most profitable growth vehicle segments, while improving or exiting less profitable vehicle lines and addressing underperforming markets. Ford is entering into formal consultation with its Works Council and trade union partners, and is committed to working together with all key stakeholders to enable the new strategy. To improve near-term financial performance, Ford will drive improvement in profitability across its product portfolio. This improvement will be driven by reducing the complexity of existing Ford products, optimizing the most profitable vehicle configurations, and increasing volumes of profitable vehicle lines. Structural cost improvements will be supported by reduction of surplus labor across all functions – salaried and hourly. An improvement in management structure, announced in December, already is underway through Ford’s redesign of its global salaried workforce, that will improve the agility of the organization. Ford aims to achieve the labor cost reductions, as far as possible, through voluntary employee separations in Europe and will be working closely with social partners and other stakeholders to achieve this objective. Ford is establishing three customer-focused business groups in Europe – Commercial Vehicles, Passenger Vehicles, and Imports – each with clearly defined aspirations and dedicated organizations. The new operating model will better enable the businesses to make fast decisions centered on customer needs. Ford of Europe is targeting a 6 percent EBIT margin longer term, with returns in excess of the cost of capital for each business group. Commercial Vehicles: Ford will continue to enhance its commercial vehicle leadership in Europe with a tightly integrated offering of smart vehicles, services and partnerships that deliver lifetime value for commercial customers. Already highly profitable, Ford is Europe’s No. 1 commercial vehicle brand in terms of sales volume, and more than one in four Ford vehicles sold today in Europe is a commercial vehicle. In line with Ford’s global fitness approach to build, partner or buy, Ford of Europe will leverage relationships – such as the successful Ford Otosan joint venture and the potential alliance with Volkswagen AG – to support its commercial vehicle growth. Passenger Vehicles: Ford will establish a more targeted portfolio of European-built passenger vehicles focused on the quality, technology-rich and fun-to-drive DNA of the Ford brand, with the goal of building emotional connections with customers through sporty and progressive designs. Every Ford nameplate from the all-new Ford Focus onwards will include an electrified option. This includes new nameplates and new versions of existing vehicles. From Fiesta to Transit, either a mild-hybrid, full-hybrid, plug-in hybrid or full battery electric option will be offered, delivering one of the most encompassing line-ups of electrified options for European customers. 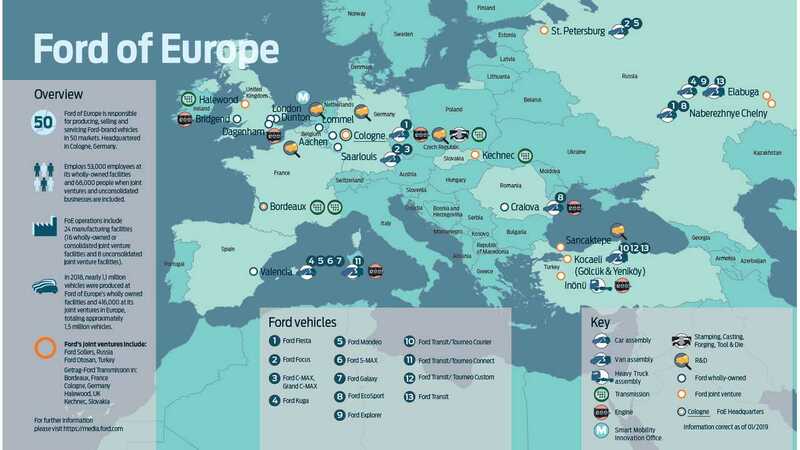 Ford also will build on its success in the growing utility segment in Europe. 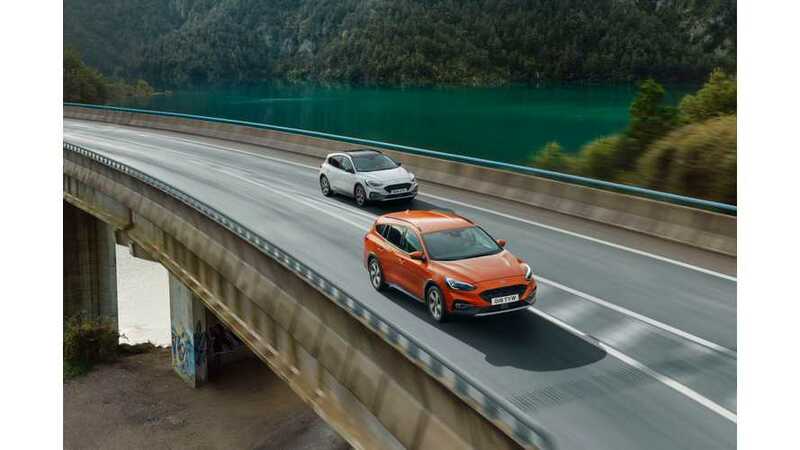 Ford SUV sales – comprising EcoSport, Kuga and Edge – hit a record high in 2018, surpassing a quarter million vehicles sold for the first time. Imported Vehicles: A niche portfolio of imported iconic nameplates for Europe that builds on the heritage of the Ford brand will include Mustang, Edge, and another SUV to be revealed in April, along with an all-new Mustang-inspired full-electric performance utility in 2020. Formal discussions have begun between Ford and its Works Council to end production of the C-MAX and Grand C-MAX at the Saarlouis Body and Assembly Plant in Germany as the compact MPV segment shrinks in Europe. Ford plans to consolidate its UK headquarters and Ford Credit Europe’s headquarters at the Ford Dunton Technical Center in South East Essex to improve business fitness and create a customer-centric technical hub. The action is subject to union consultation and local approvals. “Working collectively with all stakeholders, our new strategy will enable us to deliver a more focused line up of European-built passenger vehicles, while growing our import and commercial vehicle businesses – for a healthier and more profitable business,” added Armstrong. Ford will provide specific details of its strategy in the coming months, once appropriate formal consultation with its Works Council and trade union partners has concluded.